At today’s press conference Lisa Jackson, EPA’s top official, provided a snapshot of some of the cuts and the budget increases within EPA’s proposed FY2012 budget, released by the White House this morning. EPA Administrator Lisa Jackson lead today's press teleconference on the release of the President's budget request for EPA programs in FY2012. With an overall proposed cut of $1.4 billion from the EPA budget for FY2012, to no one’s surprise there are programs taking fairly big hits. With reductions in aid to severely cash strapped states ($950M reduction in the state revolving fund, which is slightly offset by an increase of $85M in State and Tribal assistance) the rippling effect is likely quite significant. How groups like the National Governor’s Association and the National Association of Counties (known by many as NACO) will react to the pass through of EPA funds being severely curtailed will be an early indication of the pushback to the dysfunction in government at all levels that could result from significant cuts during a time of a slow economy. Also on the losers list are the Great Lakes, with a $125M cut to a program that was heralded as a successful federal-state partnership. But if you like your water a bit saltier and you live in the Chesapeake Bay watershed things are a little less gloomy – the EPA plans to keep up the pressure on the states VA, MD, PA and the District of Columbia to enact long overdue changes and finally clean up the Chesapeake Bay. EPA will even back this up with an actual increase in federal funding with $17.4M of new funding flowing to the Chesapeake Bay in 2012. The Administration’s budget sets out to protect other Administration priorities, such as control of greenhouse gas emissions from major sources. The President is asking for “moderate increases” in programs that move forward the implementation of EPA’s greenhouse gas emissions rules that were issued in January. Other environmental programs have no hidden upside. Funding for the EPA Superfund program is cut, with a realization that cleanup at these environmental disaster hotspots will occur “at a slower rate” that historic funding levels have allowed. For those that have lived alongside these toxic disaster areas, many of which have been very slow to be cleaned up, slower than slow is hard to wrap your head around. The press conference ended with a series of questions centering around the implication to EPA if the Republican Continuing Resolution bill for the remainder of 2011 is enacted (the federal government is currently only funded through early March). No direct responses were given but it was clear that EPA will work to oppose funding proposals which will undermine their ability to protect the American people. The next two weeks on Capital Hill will be the battleground on where FY2011 spending is fought, and the outcome of that battle may prove to be a more heated battle than the FY2012 budget proposal by the President because of the pending shutdown of the government in just a few weeks. President’s FY2012 Budget hits the Web this morning at 10:30 A.M. Republican response TBD. The Administration’s Fiscal Year 2012 budget is now up on the web, with a link to the 216 page document available via the OMB website at White House.gov. A series of agency budget briefings are being held today and later this week which will provide further insight into the details of the budget. A press release from the Republican Leadership is targeted to be out later this afternoon (circa 2:30), but rather than a more detailed plan to counter the President’s proposal as was once proposed, details are believed to be scant in the Republican response on this day, with a Majority staff member from the House Budget office expecting a more complete Republican counter proposal to come out in about a month, following meetings of the House Budget Committee. With the House Appropriations Committee Mjority Staff saying they hadn’t heard of a timeline for a response and to check with Leadership, and staff in Speaker John Boehner’s office tossing out multiple options such as “check the Politico website – I think the link to the document is there” to “our response is on OMB.gov” and finally likely the most accurate answer which was “Check Paul Ryan’s [Budget] Committee – they probably know” one thing is clear – advanced coordination for the Republican response to the President’s budget release is not proceeding smoothly. The next 24 hours will indicate whether the Speaker’s office can reign in the confusion and provide a quick budget rebuttal or whether a typical process of budget hearings will mark a more normal budget planning process in the House. H.R. 1, the House Republican’s first bill of the 112th Congress, was released on Friday February 11th. 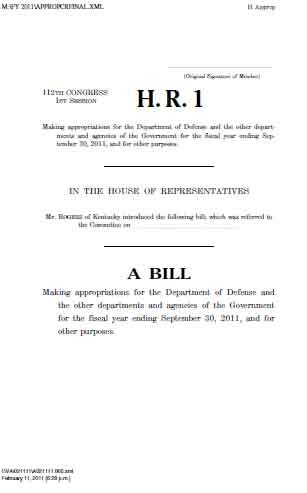 The 359 page bill outlines the cuts to the discretionary federal budget for FY2011 which the Republicans hope would result in a savings of approximately $100 billion compared to the President’s FY2011 budget request which was released in February of 2010. 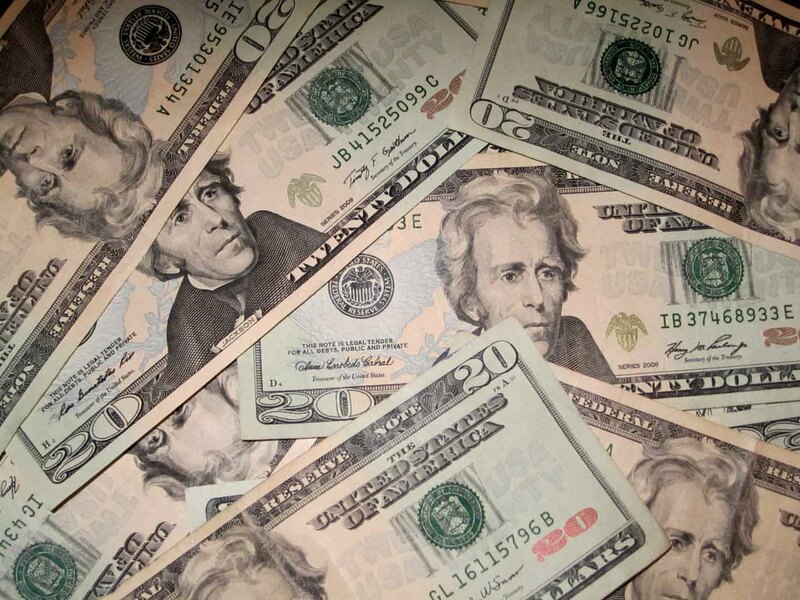 The proposed $100 billion in cuts emerged after House Appropriations Chairman Rodgers received flack after his mid-week proposal of more than $73 billion was released, a number which some in the party stated wasn’t going nearly far enough. The Republican's first bill of the 112th Congress, H.R. 1, proposed $100 billion in cuts from the dicretionary portion of the federal budget for FY2011. Cuts to the discretionary budget, which account for only a small portion of the overall federal budget, are dramatic in the Republican plan, and if passed the cuts in delivery of services to the American people will be at least, if not more, dramatic. While overhead will remain largely unchanged by a budget which will need to be executed mere days after its passage, funds that are used to execute programs will be cut at an even higher, and at this stage wholly unknown, level. But while the dollar figures for the proposed cuts and the percent reductions compared to the FY10 budget or President’s FY11 request have been the focus of the early reporting on the bill, the fact that these proposed cuts in the budget will need to occur over a 7 month period rather than a full fiscal year has been largely ignored. We are already five months onto the federal fiscal year which started on October 1, 2010. Through a series of continuing resolution spending bills for FY2011 the government has limped along on dribs and drabs of funds which have been released at FY2010 levels. And accordingly agencies have largely spent at the 2010 rate as well. This means that if the proposed Republican spending plan for the remainder of FY2011 is enacted then federal agencies will have effectively already been overspending for the last 5 months, and they will need to account for the full cuts in FY2011 in a little over half of a year. For instance, if in the Republican House bill an agency is to receive a 16% cut in funding for all of FY2011 the agency will need to cuts its spending by more than 27% for the remainder of the fiscal year, making large cuts effectively translating into cuts of such a large-scale that agencies are likely to be essentially wholly ineffective. In the coming days I’ll be highlighting several of the cuts which will dramatically impact environmental issues and a range of issues surrounding our oceans and coasts. Until then you may wish to skim through the funding bill yourself. It might serve to steel you against the shock that will occur on monday when the President releases his FY2012 budget request and the Republicans in the House release their proposed FY2012 budget counter proposition. Will the earmark ban result in unprecedented control over federal spending by the President? The ban on earmarks by the House, the President, and now the Senate means that having agency budget requests right-sized is of ever increasing importance. Typically while some attention is paid to the President’s budget, the proposal is most often looked at as a starting place with a ballpark number for what the Executive believes will need to accomplish its agencies’ missions. But fine tuning for what specifically the agencies will do with the funds Congress appropriates is often not that closely scrutinized, as Congress, through the earmark process, has been able to ensure that specific projects receive a defined allocation out of an agency’s overall budget allocation. Now, with earmarks off of the table, the executive side of government just took a leap forward in power. This means that not only will pet projects in Congressional Members’ home districts which aren’t widely supported nationally – but which were important to incumbents being reelected – be taken off the table, but Congresses’ budget authority in general is reduced. If a federal agency was reluctant to allocate resources to one particular statutory responsibility because they had priorities elsewhere, earmarks could serve as a budgetary correction, forcing an agency to address Congress’s wishes at a much finer resolution than at the huge budget block level. Whether Congress finds a way to continue to try to control the budget at a detailed level through alternative processes such as an expansion of detailed bill report language, or whether the President will be allowed latitude to implement his administration’s vision of their own priorities will pay out over the next several months as agencies’ budget hearings begin in the 112th Congress. What workarounds to the earmark ban will Senate Appropriations Committee Chairman Daniel Inouye (D-Hawaii) and House Appropriations Committee Chairman Hal Rogers (R-Kentucky) employ to maintain their power and oversight role? No one has tipped their hand so far. This will be quite the interesting policy experiment.